[FIRST ROW] Wine Bottle Holders ($14, on sale for $12 each). Red Ornament Plate (sold out). 5-Piece Wine Bottle Accessory Set ($34, on sale for $25.50). [SECOND ROW] Sweet Bird Cup and Saucer Set ($27.96, set of four). Bulldog Bottle Stopper ($16.50, on sale for $11.50). Rocky Road Popcorn ($38). [THIRD ROW] Corkers (sold out). Measuring Hedgies Set (sold out). Chalkboard Tin Candle (sold out). [FOURTH ROW] Hot Rod Heated Mug ($24.99). Owl Teacup + Saucer ($14 each). [FIRST ROW] Cottage Stripe Cotton Storage Basket ($34). Whimsy Animal Corkscrew ($39.95, on sale for $29.95 each). Peach Bellini Mix ($6.99). [SECOND ROW] Dropp! Bowl ($48). Buono Vino Wine Stopper ($22.99)– gives back to charity. Chevron Latte Mug (sold out). [THIRD ROW] Okuno Measuring Cups ($36). Olive & Cocoa Signature Frost Candle ($38). Whale Bottle Opener ($20). 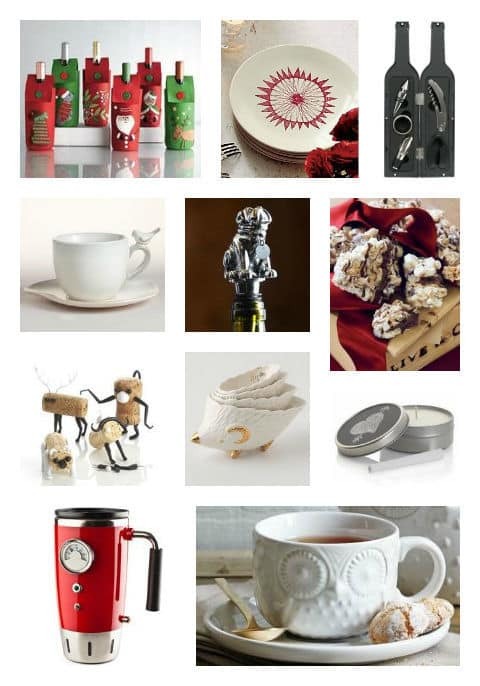 [FOURTH ROW] Partridge In A Pear Tree Salt & Pepper Shakers ($39.50). Scottish Terrier Shaped Handmade Green Tea & Lemongrass Scented Soap ($11.85) by Artists at Handmade By Moi Shop. Thank you for dropping by The Mindful Shopper! I absolutely LOVE it when you stop by! 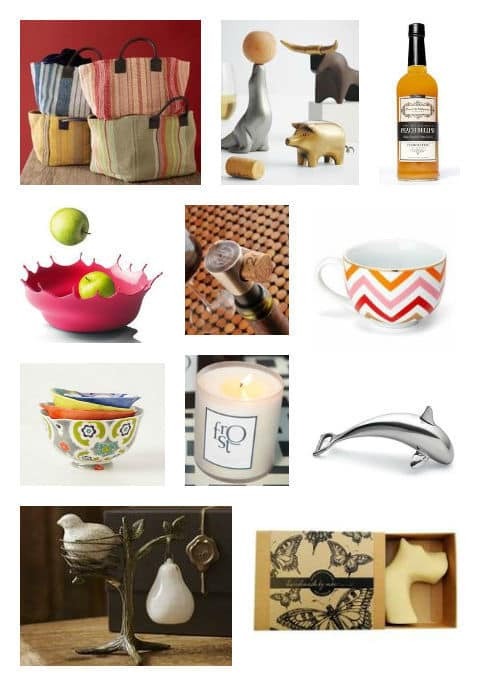 I hope you enjoyed my post all about “Lovely Hostess Gifts”!